Melanie’s book waited patiently for me by my bedside while I was busy traveling and working on YaYa & YoYo Book Number 4. (Still working on it!) My travel schedule has recently quieted down and I have a bit more flexibility with my time, so I finally sat down to read Melanie’s book and to write about it. I have to be honest–I was a bit nervous, and perhaps even a little intimidated about diving in. While I appreciate classical music, I can’t imagine I’d likely choose a book with a cello on the cover on my own. And despite the fact that the hosta plants growing in my front yard keep coming back year after year, and that I can maybe manage to keep one tomato plant alive each summer, I really can’t call myself a gardener. So if it wasn’t for the fact that my friend happened to be the author of this book, I probably would have missed it. And that would have been my loss. Giant Pumpkin Suite is Melanie Heuiser Hill’s first novel, but you’d never know it. She writes like a seasoned author. Her style reminds me of some of my favorite books from growing up. The language, dialogue, and cadence in this book has a sweet, innocent feel which hearkens back to a simpler time when kids played outside all day long during summer vacation and were not drawn indoors to spend their free time on electronic screens. It recalls the flavor of one of my favorite childhood novels, and I’m guessing from its prominence in this book, one of Melanie’s as well–Charlotte’s Web. I love the parallels she draws between the modern-day story of twins Rose and Thomas Brutigan, ultimately planning a trip with their pumpkin to the Minnesota State Fair with the story of Fern Arable in Charlotte’s Web and her journey with her animal friends to their county fair. My favorite part of the book was the varied cast of well-developed characters. I particularly enjoyed watching Rose, a strong female lead character who loves math, and who takes herself very seriously, grow and mature throughout the story. I loved the assortment of neighbors. In particular I liked how this very eclectic group of people, whose only commonality was that they all lived on the same street, came together over this project that Rose and Thomas had going on, namely, growing a potentially prize-winning, ginormous pumpkin in their neighbor’s yard. I also loved that the story was set in a suburban Minneapolis neighborhood much like the one in which my family and I live. We have wonderful neighbors but the winters here are fairly brutal and we all tend to hibernate until the beginning of the “Thaw” in March or sometimes even April. We often don’t see one another until the warmer months when we finally emerge from our homes and spend time outside, chatting on one another’s lawns, catching up on family news, and maybe sharing cuttings from some of our outside plants. (I guess I do like some gardening after all!) Even still, we’ve never had an event on our street that drew all of the neighbors, young and old alike, together like growing a giant pumpkin as Rose and Thomas did. I think it would be a terrific experience and it made me even a bit jealous of the fictional characters living on Library Lane! 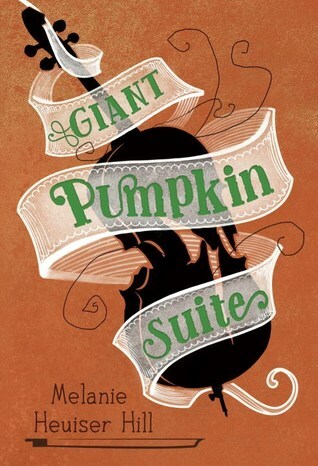 I highly recommend Giant Pumpkin Suite for middle grade readers as it is about so much more than large musical instruments and even larger vegetables. It’s about relationships between friends, siblings, and neighbors. It’s about reaching beyond our comfort zones and even our self-imposed boundaries. It’s an enjoyable story of growth (sometimes gigantic growth! ), togetherness, and cooperation that should not be missed. Just read your blog post. ( Impressive height difference.) I was attracted to the title of Melanie’s book because my neighborhood has been hosting a giant pumpkin weigh-off event for over 20 years now. We have food, activities, marching bands and so much more; a real throw back to the wholesome good old days. Looking forward to reading the book.